This article is part of Managing bug report in issue tracker series. Important note: there are events for customizing sending: such as OnAttachedFilesRequest, OnZippedFilesRequest, and OnCustomWebFieldRequest. Simple customization includes changing message to fixed static message. For example, message can specify location, where to get patches/updates for your software. You can do this by changing message in localization options. More advanced approach includes using of dynamic messages and custom HTML-feedback pages. You can include custom message for each bug or open a web-browser with specified page to display extended message or ask user for more information. You can customize your feedback messages either by using special tags or by using bug tracker features - see below. Mantis, JIRA, BugZilla, Redmine, and HTTP upload do not have any special features for customizing feedback. However, you can use special HTML tags. • Mantis/BugZilla/JIRA/Redmine/YouTrack: when you're about to close bug - you need to close it with adding message/note. You can write your internal comments (they will not be reported to your users) and you can optionally insert a customization tags. Note: special tags must be placed in last comment to the issue. If you make more comments to closed bug later - make sure to re-post comment with customization tags. • HTTP upload: when you've finished processing uploaded files (HTTP form's data) - generate a HTML page with customization tags. Currently, EurekaLog supports only 2 tags out-of-the-box: EurekaLogStatus and EurekaLogReply. EurekaLogStatus tag must contain an integer value, which represents operation status (TSendResult type). Most typically used values are srSent, srBugClosed, srInvalidInsert and srUnknownError. srSent and srBugClosed are considered as success status. All other codes are considered as failure. If this tag isn't used, the srSent is the default. Note: it's important to use numeric value (like, '0', '1', '$1'), not name itself (like 'srSent'). You can use this tag to alter status of sending, but usually you omit this tag. EurekaLogReply tag contains arbitrary string, which will be used as custom message, describing the operation. If this tag isn't used, the message will be default, as usual. If status of the operation is the success (srSent or srBugClosed), then this message will appear in SuccessMessage field of TResponse record. If status is failure - message will appear in ErrorMessage field. Message will be displayed to user, if you've enabled corresponding options. 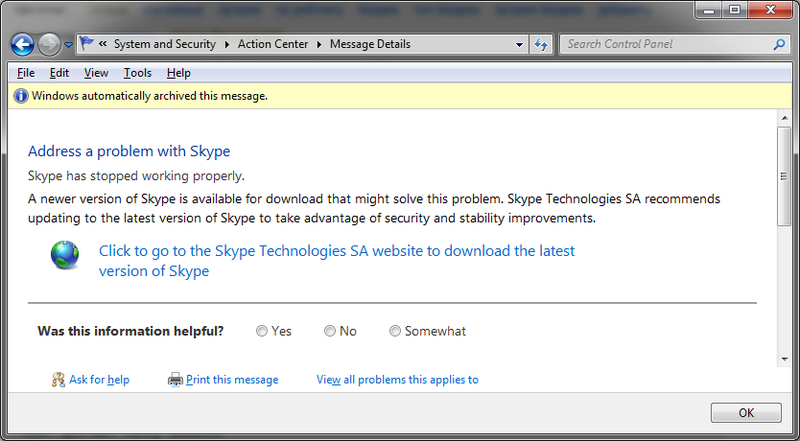 Alternatively, you can insert a http:// or https:// link into message. In this case EurekaLog will open a web-browser for this link without showing any other message. Showing HTML page can be used to present "pretty" message, detailed instructions or other advanced messages. For example, if "bug" is not a bug in your software, but problem in run-time configuration, you can insert the URL to your knowledge base article, which describes solution. Another example - you can't solve bug with existing bug report's information. Thus, you close bug and use an URL to web-page, where you ask user to submit more information. <EurekaLogReply>This issue is already fixed! Can't solve :( Need more info! Last example alters send status from default srBugClosed to srSent. See also: HTTP upload to get more examples of customizing feedback for HTTP upload method. FogBugz have feature of controlling field reporting. This feature is used with FogBugz's BugzScout software - a tool to gather report "from the fields". But EurekaLog is perfectly capable of using the same control mechanism. You can also re-enable report collecting by selecting "Continue reporting. Of course, report collection will be stopped, once issue is closed. 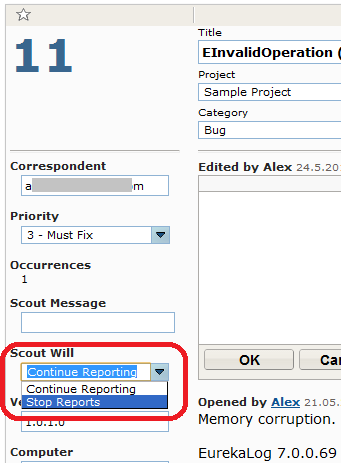 Second, you can use "Scout message" to set a custom message for closed bug reports. This option acts the same as EurekaLogReply tag above. You can either put a simple message here or specify an URL to the web-page. You specify developers comments and end-user message separately: use standard note form to create new developer comment and use "Scout message" to set custom end-user feedback message.